College of Engineering students lead outreach activities in public spaces like libraries, Girl Scout meetings, and Boy Scout meetings. One of the current initiatives is Brain STEM, a pioneering effort led by the UNT Society of Women Engineers. Through Brain STEM, UNT SWE designs engineering-based activities to share with K-12 children in public libraries. The lessons integrate methods from all learning styles, allowing all students to understand the concepts. 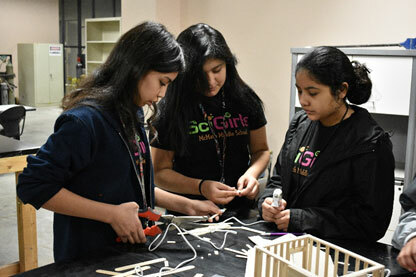 The College of Engineering partners with Dallas SWE and Latina SciGirls to support their NSF grant that assesses the effectiveness of Spanish-language programming in an organized after school program. These programs are presented in both Spanish and English. We actively participate in STEM-related community events in DFW each year that allow us to promote engineering and STEM with K-12 students and their families. In recent years we have participated in Earth Day Texas, Dallas ISD STEM Expo, Coppell Science Fair, as well as STEM nights at various schools in DFW. We participate in Earth Day Texas every year where we talk with hundreds of K-12 students about engineering and let them participate in hands-on activities. Our recent projects have educated kids about wind power and structural stability. 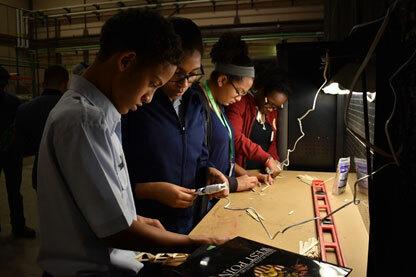 The college hosts day-long engineering design experiences for middle and high school students. Our student organizations organize projects for our STEM @ the Park events, allowing K-12 students to actively engage with our current students. 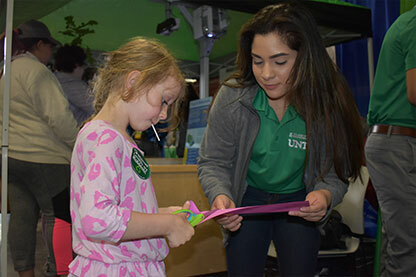 UNT SWE has recently co-hosted Design Your World where K-12 girls were able to learn about engineering through activities that highlighted different engineering disciplines. On November 11, 2017, we hosted over 200 high school student at our first STEM@thePark event, which was co-hosted with West Point LEADS. Students participated in hands-on engineering and leadership activities. We hosted 2 STEM@thePark events in spring 2018. We welcomed 125 high school students in February and twelve 6-12th grade girls and their parents in March. Students who attended got a comprehensive view of the fields of engineering through projects like robotics, ballistics, construction, and drones. We host group tours of UNT Discovery Park where the College of Engineering is located. Your group can see our labs, learn about our research, and discover what it is like to be a student in our programs. We host tours for K-12 aged students, community college students, community groups, and more. Need information on outreach conducted by programs at UNT? Contact Kathryn Beasley.